As much as I live for the summer months, I truly love the clothes that come with winter. Nothing makes me want to suit up and get all fancy more than a nip in the air and a need for additional layers. True fact: tights automatically make any outfit look extra fancy, as do scarves. Never mind that I’ll be sick of the cold in a record amount of time (2 weeks? Maybe?). For now, I’m going to relish the fact that I can finally sew up those non-breathing polys that I can’t stand to touch when it’s hot out. 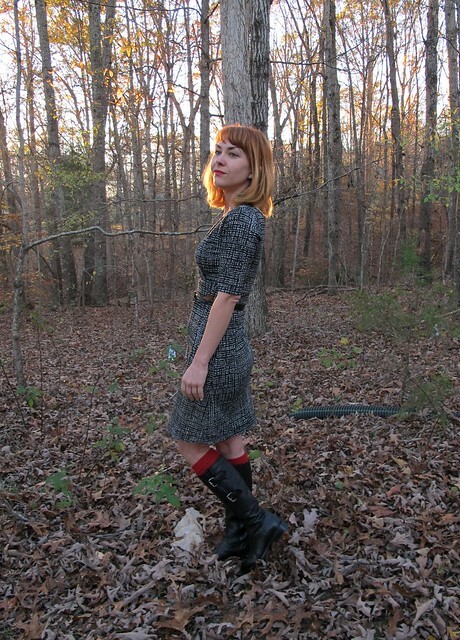 This black cozy knit from Mood Fabrics (looks like it’s completely sold out at this point – sorry! I may or may not have bought the last yardage that was available online, ha!) is one of those polys that I had to have, but had to wait to sew. It’s a mostly polyester blend, and it feels like a thin ponte with a slightly fuzzy/sweatered texture on one side. 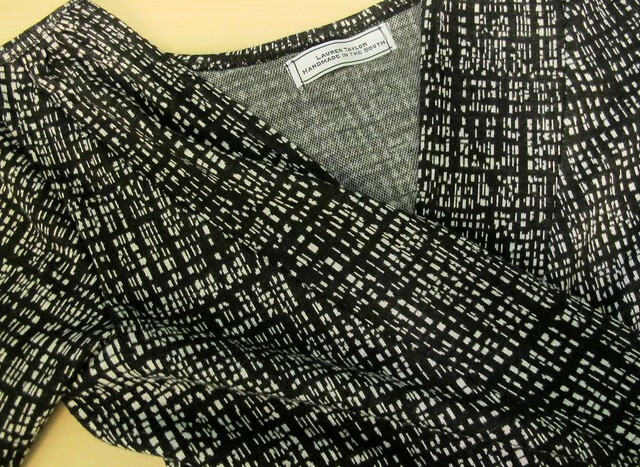 The random white print is woven into the fabric, which means the wrong side looks pretty neat, too. 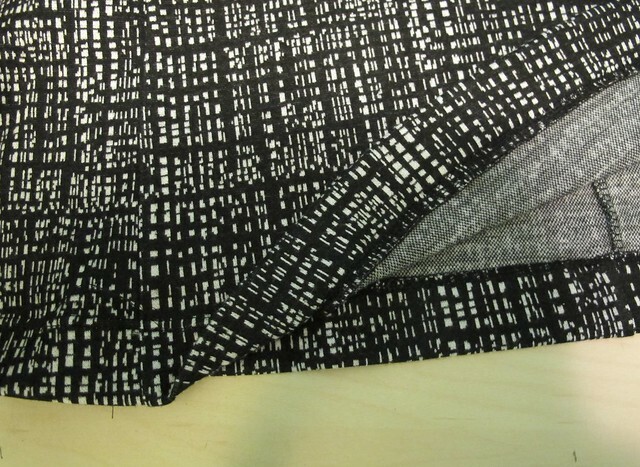 This is the kind of fabric that would be perfect for office-wear – the stretch is SUPER comfortable, it has just enough weight and thickness so that it doesn’t cling, and the black and white print is quite classy. Why I gravitated towards it, I’m not sure (it’s not like I work in an office setting these days!). 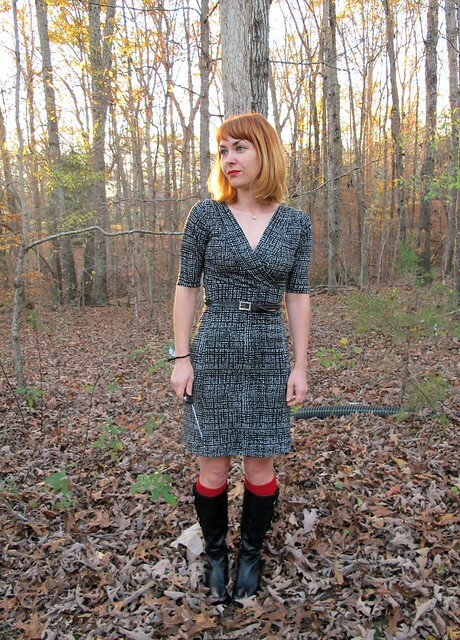 But I do love wearing black in the winter, and I love me a good ponte knit dress. 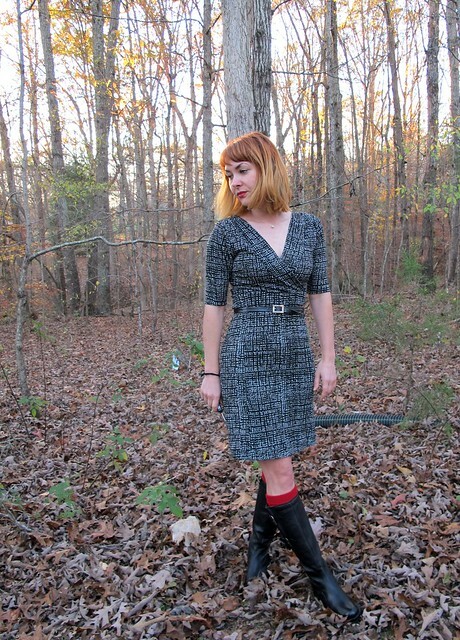 I used the Wren dress from Colette Patterns. I loved the surplice neckline, coupled with the fitted skirt (again, something I don’t normally tend to gravitate toward in terms of clothing – but it’s a knit! It’s so comfortable!) and the elbow-length sleeves. It’s a nice, basic dress that will work well for all those fancy parties and concerts I’m always attending. Just kidding. It’ll be super comfy to hang out on the couch in. At least I know I’ll look good. What I really love about this fabric – other than all the drooling I’ve already wiped all over this post, sorry – is how neat the design looks up close. It reminds me of a city skyline at night, just millions and millions of windows. The dress itself was very easy to put together, and was finished in an afternoon. I sewed everything on my serger, and did all my hemming (neckline, sleeves, skirt) with a twin needle. I found that the fabric responded well to pressing, even despite it’s poly content. That being said, I have a silicone “shoe” on my iron, so that does help. A presscloth would also work just as well. A Silk Tunic and Faux Leather Leggings!